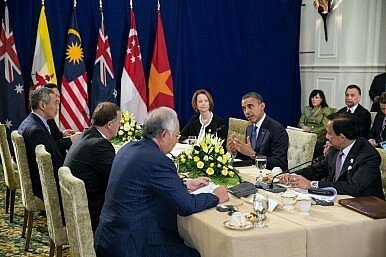 The Diplomat‘s Ankit Panda speaks with Devin Stewart about the Trans-Pacific Partnership. After nearly five years of difficult and sustained talks, twelve Pacific Rim states have finalized the text of the Trans-Pacific Partnership (TPP), a free-trade agreement that has the potential to change the face of global commerce. The TPP encompasses 40 percent of the global economy and a quarter of its trade. To better understand the implications of the agreement and its implication, The Diplomat’s Ankit Panda spoke to Devin Stewart, a senior fellow at Carnegie Council for Ethics in International Affairs. Stewart worked on the preliminary strategic blueprint for the TPP earlier in his career and is a Japan specialist. Twelve states, including the United States and Japan, have agreed to a final text for the Trans-Pacific Partnership agreement. In your view, how significant of an accomplishment is this for the United States, which identified the TPP as part of its ongoing “pivot” to Asia in 2011? Given the difficulties of reaching agreement with so many interests represented at the bargaining table, it is a big accomplishment. Most of all, TPP if passed by Congress will give the United States a boost in influencing the future shape of a rising Asia. The agreement is as much about geopolitics as it is about international trade. The TPP has the potential to become President Obama’s biggest foreign policy success at least on par with the Iran deal, Cuba opening, and transition transpiring in Burma, which the United States supported. Finally, the TPP would give credibility and substance to the Obama strategy known as the pivot or rebalancing toward Asia in line with the claim that the strategy was intended to be more than just about moving around aircraft carriers. The Asia pivot is supposed to be a comprehensive strategy encompassing economics and diplomacy as well as security. The TPP, which actually has been in existence since 2005 and thus predates the pivot, makes that a reality just when some experts were beginning to doubt the pivot strategy. So the timing is fortunate too. In sum, the TPP agreement is “huge,” to borrow an expression from Donald Trump. As a Japan specialist, can you describe how the TPP talks have been perceived in that country? Shinzo Abe’s government has naturally been keen to conclude the agreement, but a range of domestic interests and stakeholders have concerns about the agreement’s provisions. Like in any large democracy, there is a plurality of opinions in Japan. Certainly some people will see it as a threat to traditional sectors, such as rice, or conflate it with Japan’s military ties with the United States or the anxiety of globalization and corporate influence in general. But many Japanese elites and officials support the TPP—as a counterforce in the face of a rapidly growing China, a way of keeping its ally the United States present in the region, an instrument that will strengthen Japan’s influence in Asia as a shaper of norms, and as a way of pushing through much sought-after reform domestically. Deregulating the Japanese markets has been an ongoing project for decades, and the idea of a US-Japan FTA itself dates back to the Ambassadorship of Michael Mansfield in the 1980s. Prime Minister Abe has a strong case to sell the TPP domestically, too. First, Japan was able to get some concessions on its sensitive rice sector so Abe can look like a hero to his country’s farmers. Second, TPP finally gives substance to the economic policies known as Abenomics, which has heretofore been mostly about monetary pumping of the economy through quantitative easing, which was invented by the Bank of Japan. The TPP provides Abe with a convenient answer to the question: What is Abenomics 2.0? If Abe can get the TPP through the Diet, it will have come just in the nick of time for him politically. Going forward, domestic legislatures in each of the 12 TPP signatory states will have to ratify the agreement. If that doesn’t happen within two years of signature, the TPP can come into force if six original signatories who between them account for 85 percent of the group’s GDP ratify the agreement. Since the United States and Japan together account for nearly 80 percent of the GDP of the 12 TPP states, their participation will be necessary. How challenging will ratification be in the United States and Japan respectively? While Abe has several political advantages, including a fairly positive momentum domestically and some apparent progress on resolving the dispute over the Northern Territories with Russia, he still needs to win over members of the Diet who are on the fence regarding the TPP against pressure from Japan’s powerful agricultural lobby. For Obama, meanwhile, it will likely be even harder to get the TPP past a hostile Congress so close to the U.S. presidential election and with so much high-profile opposition to it, notably Ford Motor on the corporate side and Hillary Clinton, Bernie Sanders, and Donald Trump on the political side. Nevertheless, President Clinton was able to pass NAFTA under similar circumstances in 1993. A major challenge is that the American public has become more skeptical of free trade and globalization since then, symbolized by the 1999 protests in Seattle against the WTO. And Republicans in Congress will be reluctant to hand a victory to a Democrat in the White House. Yet I still think the TPP has a chance if a sufficient number of Congress people see the TPP as serving the national interest and security (as well as those of their corporate backers) especially against the backdrop of an increasingly assertive and powerful China. You were involved with what became the Trans-Pacific Partnership in its primordial phase. Can you tell us a bit about what it’s been like seeing the agreement evolve over the years? Has the public discourse surrounding the TPP surprised you? I have felt a bit like the creator of Frankenstein’s monster. A decade ago, when I and other Asia hands developed the concept for the TPP, our goal was actually quite idealistic: The point of the enterprise was to promote labor standards, human rights, environmental projections, and prosperity in Asia without the use of force or coercion. It was also part of an American hedging strategy on China’s rise. Let’s also remember that the free flow of trade is a classically liberal idea. Over time, however, the lobbyists, lawyers, and corporate money corrupted this pure idea, turning it into something more questionable in its current form. Will the TPP become a good monster or bad one? I’m not sure, and I can understand why there is now opposition to the TPP these days, for example over the provisions that would restrict access to generic, affordable drugs. Ironically, it is also these corporate interests that gave it viability. It’s sad, but as Paul Krugman has recently pointed out, an FTA is sometimes most politically viable when it is socially harmful. It’s a statement about political economy and vested interests. It’s about the legal but nonetheless unethical nature of corruption in American democracy that economists like Robert Reich have lamented. Trade policy is not glamorous so the level of public engagement may be somewhat surprising but scrutiny is crucial, as the TPP is not a perfect agreement, and citizens should have their voices heard. I’ve seen a lot of criticism of the TPP from well-informed observers who warn that it isn’t quite a simple “trade deal.” The agreement’s provisions for dispute resolution and standards indeed make it the first agreement of its kind. Do you worry that the TPP’s ambitious scope could validate some of these critics who fear that signatories risk their sovereignty to satisfy the interests of powerful private actors? A major reason why the TPP goes beyond a simple trade deal is due to the success of the GATT and WTO process, which has brought down world tariff levels already. In order to address more tenacious issues such as regulations that protect domestic industries, a more complex agreement is required. But more than that, the TPP’s ambition goes way beyond trade. It’s true that all trade deals are intrinsically political, but the TPP is explicitly so because it is an attempt to advance standards regarding environmental projection, labor rights, intellectual property, government procurement, and state-owned enterprises. Paradoxically, some critics say that the TPP does not go far enough, for example, by addressing concerns over currency “manipulation,” which they worry would negate the positive effects from the reduction of trade barriers. Finally, the elephant in the room—or rather, not in the room in this case—China. What are the prospects for China ever joining the TPP? The prospects for China eventually joining are pretty good. Having the TPP be open to other countries, including South Korea but especially China, was a stipulation of the agreement getting off the ground. This so-called open architecture was necessary for experts to support the TPP concept without worrying that it would be excluding China or forcing other countries to choose between “China and the West.” Even the Pentagon has wanted to avoid that as it could usher a new Cold War. In some respects, having China outside the TPP would be suboptimal because the ideal was to use trade as an enticement for reform and high standards in Asia-Pacific commerce, including in China. The TPP’s sections on state owned enterprises, government procurement, and labor standards, including unions, are of particular relevance to the Chinese economy. China has shown that it can establish important regional institutions in the formation of the AIIB, and now the United States and its friends have a viable response to that innovation. Just as the United States and Japan would be well advised to join the AIIB, the ideal world would have China included in the TPP, thus weaving together the region toward a shared future and prosperity. After APEC, Whither the Trans-Pacific Partnership?Trans-Pacific Partnership: Time for Some American HustleTrump Killed TPP. What's Next For Trade in Asia?Japan: Shinzo Abe’s Upcoming Election TestAbenomics 2.0: A Reform Reboot For Japan?